HOLY COW, CAN YOU SAY “TUNA”??!?? 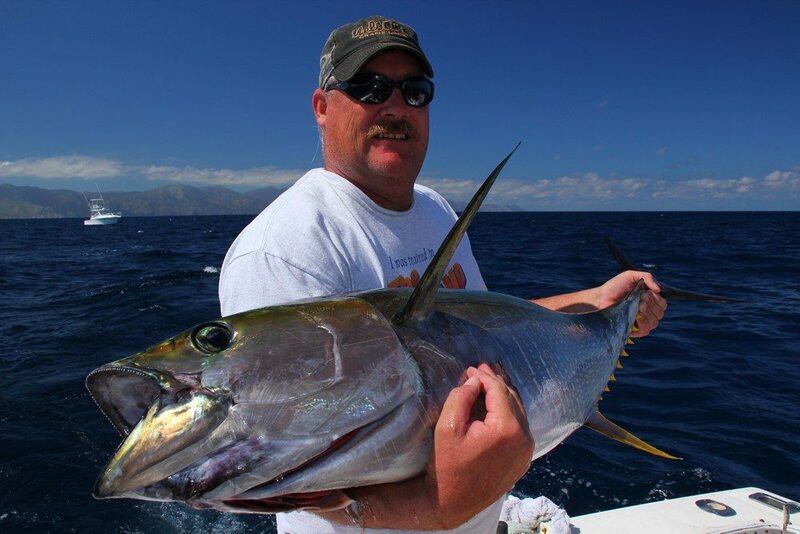 The past few weeks have been excellent for fishing here on the East Cape, and leading the way has been a resurgence in the numbers of huge yellowfin tuna swimming in our fishing grounds. We started off by cracking the elusive 100# barrier, and soon thereafter we had a few exceeding 200#! The four fish pictured above (top-to-bottom-left-to-right) weighed 214#, 101#, 129#, and 110#…beautiful tuna anywhere!!! Plus, lots of 15-50# schoolie fish mixed in, both for good fishing action and perfect table fare! The best bait has been chunk calamari, and on most days having ample squid for bait has been the difference between catching tuna and not catching tuna. 2016 continues to hit historic highs in terms of the wahoo fishing. While we typically see highs and lows for wahoo success throughout the peak season–with June and July traditionally being among the best months–this year, we’ve had steady wahoo fishing more or less all year. Many boats targeting wahoo are catching 2-4 fish per day, and while the size range is all over the board from 20 pounders all the way up to 50-60 pounders, you can never complain about delicious wahoo steaks! A steady blue marlin bite continues. Lots of nice blues 200-400# this season. On top of that, we’re still seeing good numbers of good-sized striped marlin as well as sailfish tallying overall billfish catches. Throw in a few decent dorado, and fishing doesn’t get much better. Inshore, we’re still seeing some roosterfish, but the big ones have moved on for the year and we’re mostly catching juvenile specimens. A few jack crevalle, cabrilla, pargo, and triggerfish are rounding out the near-shore bite. Sea surface temps are still hovering in the high 80’s, and with daytime air temps in the 90’s, hot weather and hot water equals hot fishing on the East Cape! You can’t beat our Hotels and boat fleet for great fishing and excellent value in your vacation, so be sure to book your late season 2016 or 2017 Baja fishing trip soon! !